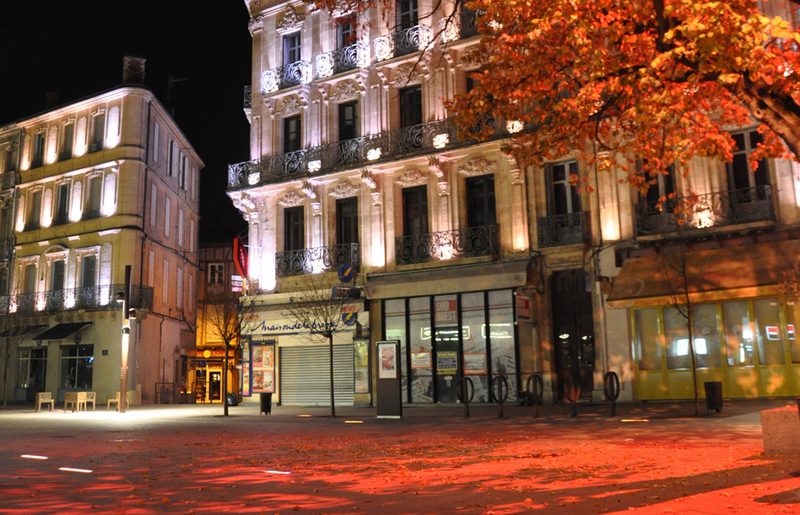 The city of Agen in France is undergoing great changes with several projects seeing the light of day in recent years. The facades along Boulevard de la République and Place Wilson have been beautifully illuminated thanks to the use of 350 Martin Tripix 300™ linear LED luminaires and 6 Exterior 410™ color changers. In charge of the project and installation were companies Electromontage and Inéo while lighting design was by Lionel Bessière of the Toulouse-based company Quartiers Lumières. The Tripix 300s are attractively-designed IP66 LED bars based on tri-color LEDs for a better mix of colors under the lens. This produces a wide range of shades, in particular bright whites, subtle pastels, and vibrant saturated colors, with no chromatic decomposition. The Exterior 410 houses very powerful pre-mixed LEDs and is used for lighting designs requiring perfect chromatic composition with no color separation. Its RGBW color mixing system offers a wide palette of rich colors and its 5600 lumens of output is very bright indeed.